A new name and a new look. Rodale has given 73-year-old Organic Gardening magazine a complete makeover. 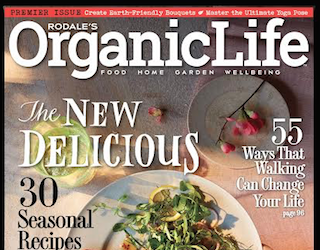 The magazine is now titled Rodale’s Organic Life, and the focus is no longer on just dirt and plants. As the name suggests, Organic Life is interested in a way of living. Organic Life hits newsstands tomorrow. It will publish six times per year and feature a wide array of content. Its first issue includes articles on sustainable flowers, the science of walking and what it’s like to go salmon fishing in Alaska. Oseland considers Organic Life not necessarily an improvement on Organic Gardening, but rather a sign that “organic” means lots of things, and the new magazine will attempt to cover it all. “It’s about all aspects of living mindfully and healthfully here on planet earth: it’s about the gardens and homes we create, the food we cook, the families we raise, and much more,” said Oseland.